I guess many would have known the power of compounding but some would not know the significance and how much impact it can do to one's portfolio. I have mentioned so much about investing and the earlier one knows the strength of savings and investing (and know how to invest comfortably), the better it is for a person. A person's work life can only stretch to as long as 60 years of age in Malaysia. That means a total of say 37 years of work life. Man is known to live longer now, as an example, my grandma is now 92 and healthy. Hence, over here I am going to reiterate the power of compounding although many would already know about this. Some however don't. For a person to manage to get a consistent return of 10% every year, it will take roughly 7.2 years for the investment to be doubled. How Rule 72 applies is through, say you want to double your principal, and you want to know how many years your principal can be doubled assuming the interest or return you are getting is on a consistent basis. You do that by dividing 72 from the consistent return you are going to get. 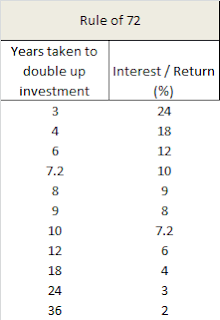 From below table, assuming one gets a consistent return of 8%, he / she would double his principal from investment in 9 years. To our daily life, the significance is quite drastic. If we put our money into the bank and get 3% (that is what we are getting for many years now), it would take a long 24 years to double up our savings. If EPF consistently pays 6% every year, it would take 12 years for the person to double up his savings there. Hence, if you have savings of RM500,000 in EPF today, and if the managers have done well to return you 6% every year, you will double your money to RM1 million by 2025, assuming there is no fresh savings. Say I am targeting a 10% return on average from my investment, I would need to take 7.2 years to get my investment doubled. What if I am a better investor, and I get say 18%, that's only 4 years to see my investment doubled. On another note, for a company which has a consistent Dividend Yield of 6%, your investment would probably see it doubled in 12 years. The flip side of it, for those whom have credit cards debt of say RM20,000, you will double your debt owed to the bank in 4 years, because they are charging 18% on your credit. Albert Einstein called compound interest the eighth wonder of the world. Yes, it is a very powerful and useful tool if put to use. Many ways in using it. E.g. A reaches his 1st million when he is 30 years old. A wants to be a billionaire when he reaches 60. What is the required return rate for A to reach his billionaire milestone? Count how many times A needs to double his wealth to reach the 1st billion. That is, he needs to double his money every 3 years. With 1 million at 30, if A can find an investment wich can return 24% pa, A will be a billionaire when he reaches 60 years old! P/S One similar rule for tripling the money, rule of 110 (could be 11x, can't remember now). To triple your money, it is rule of 114. To quadruple (4 times), it is rule of 144 (easy to remember, 72*2).